Laboratory Medicine on the Oxford Road Campus requires the use of the electronic order communication systems wherever possible. Sunquest ICE communications systems is in operation. The ICE system interfaces with, the trust patient administration system and therefore the request form and sample label will print with full demographic and request details. Barcoded ICE labels MUST be printed at the time of sample collection using the WOW station at the patient’s bedside, (see the trust standard operating procedure for ICE). This ensures that the time on the sample is the time of collection and NOT the time the request was made and importantly that it is the correct patient who has the correct sample taken preventing ‘wrong blood in tube’ (WBIT) incidents. Please ensure that you order the correct test and select the correct specimen type as failure to do this may lead to incorrect testing. 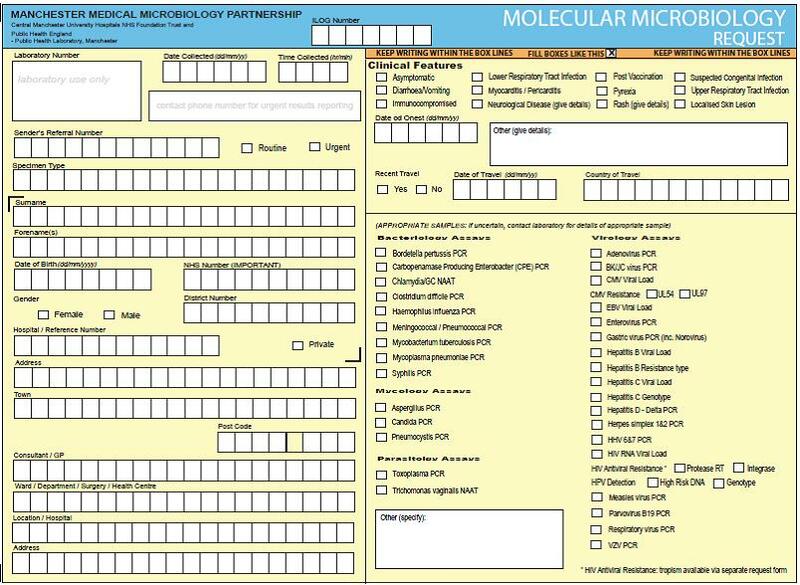 The ICE requesting system will show those tests most commonly requested for Microbiology Services, should the test you require not be visible please contact the laboratory to check that the test is available. 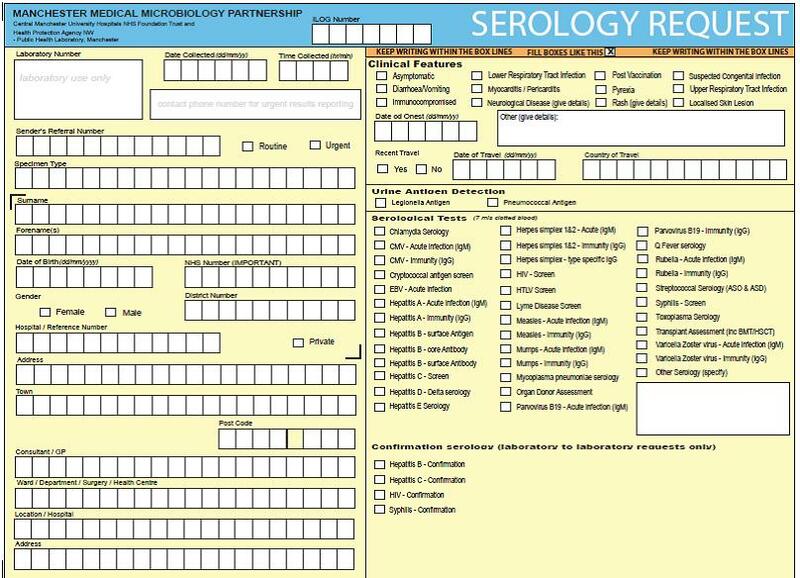 This information is the same as that is required on handwritten request forms and should include clinical details and symptoms as well as information on antibiotic use, foreign travel, outbreaks, date of onset etc. 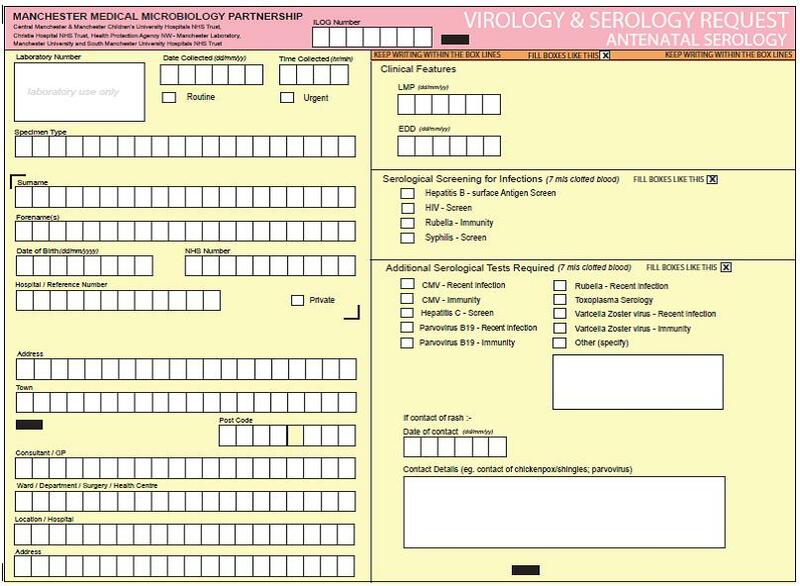 You are strongly requested to use these new forms in preference to any other (including previous versions of Virology request forms: please destroy all previous versions) in order to improve the way in which your requests are dealt with. Please note the following instructions for use; compliance with these will also greatly improve the quality of the service we can deliver to you and ensure the reports reach you in a timely manner. All information on the forms must be in block capitals and must be kept within the boxed areas provided. Please do not write over the lines of the boxed areas. The tests required are selected by marking the boxes with an “X”. If addressograph labels are used (which we recommend), they should be placed within the “∟” marks that surround this section of the form. All labels attached to the forms must be properly aligned in the appropriate position on the request form. 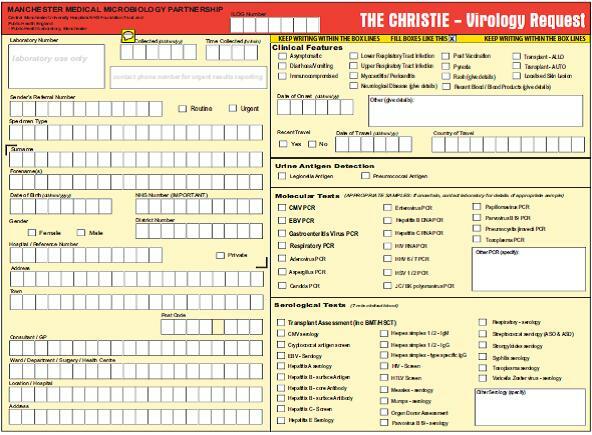 c) Details of our specimen acceptance policy can be found on the reverse of the form, along with other useful information. Finally, we would like to thank you in anticipation of your cooperation in using these forms in the correct way, therefore, greatly improving the quality and speed of the service we can provide. The forms for the requesting of VEU investigations have been developed to be consistent with other MMMP request forms. You are strongly requested to use these new forms in preference to any other (including previous versions of VEU request forms: please destroy all previous versions) in order to improve the way in which your requests are dealt with. 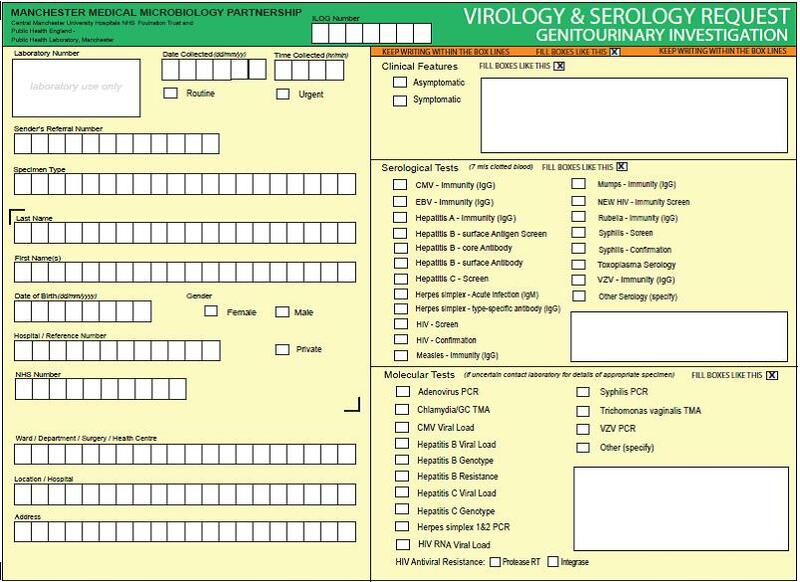 The form for the requesting of bacteriology investigations have been developed to be used If ICE is not available.